A crew of six scientists and engineers is geared up and ready for an eight-month mock mission to study how humans living in Mars-like conditions behave and interact. 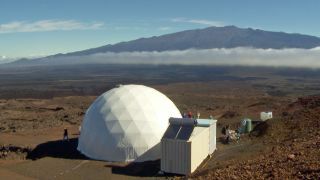 This will be the fifth mock Mars mission for the Hawaii Space Exploration Analog and Simulation (HI-SEAS), which is funded by NASA. HI-SEAS' goal is to simulate what life might be like for astronauts on long-duration space-exploration missions, such as the journey to Mars, by putting groups of volunteers inside a dome-shaped habitat for months at a time, isolated from the rest of the world. You can see photos of what a HI-SEAS Mars mission is like here. "Since 2012, HI-SEAS has been contributing to NASA's plans for long-duration space exploration," Kim Binsted, HI-SEAS principal investigator and professor at the University of Hawaii at Mānoa, said in a statement. "We are an international collaboration of crew, researchers and mission support, and I'm proud of the part we play in helping reduce the barriers to a human journey to Mars." While living in the confines of the remote HI-SEAS habitat, the crew will perform outdoor exploration tasks, such as geological fieldwork and life-systems management. Just like they would on Mars, the crew will wear spacesuits while working outside the dome. They will also participate in eight primary and three opportunistic research studies for other research partners, officials said. "The primary behavioral research includes a shared social behavioral task for team building; continuous monitoring of face-to-face interactions with sociometric badges; a virtual-reality team-based collaborative exercise to predict individual and team behavioral health and performance; and multiple stress, cognitive countermeasure and monitoring studies," HI-SEAS officials said in the statement. Other daily activities will include routine exercise and food preparation, with meals that resemble the dehydrated foods astronauts eat in space. To simulate what it would be like to make contact with people on Earth from millions of miles away, there will be a 20-minute delay in communication between the crew and mission control. This will be the fifth HI-SEAS mission, following a 12-month endeavor that ended in August 2016. Previous HI-SEAS missions include two four-month missions in 2013 and 2014, and an eight-month mission that ended in June 2015.